The sight of Jeremy Kyle’s name – super sized on a TV screen – may not be for the faint hearted but it delighted members of the visually impaired community. A brand-new TV Box home entertainment system from specialist software/hardware company Synapptic was one of the stars of the Assistive Technology show at N-Vision, the Blackpool Fylde and Wyre Society for the Blind. And it’s this kind of technology that enables those with sight loss to retain independence within the home, and also stay connected to the outside world. The charity, based at Bosworth Place, Squires Gate, regularly runs exhibitions at Sharples Hall of the latest technology. It’s tomorrow’s world today for techies out to throw open the windows on a world for people with reduced, low or indeed no vision. The charity already runs regular specialist support sessions for those using Synapptic software on tablets and Smartphones. And, from next month, locals living with sight loss across all three local boroughs will be able to attend coaching sessions and one-to-one’s to develop their digital skills. Community services manager Maria Kirkland said: “We’re working in partnership with Synapptic. 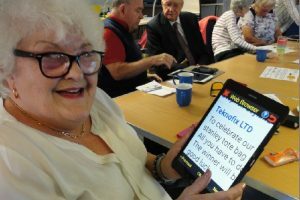 We are delivering coaching sessions within the communities of Blackpool, Fylde and Wyre to teach individuals living with sight loss to use Samsung Tablets with Synapptic Software on them. One regular, Rex Keating, reckons it’s well worth travelling over from Bolton with his daughter Tina to join Fylde coast locals taking part in monthly Synapptic sessions at N-Vision. Rex, who has macular degeneration, admits: “I was really interested in how technology could help. I couldn’t find anything like this support closer to home. The options available here are amazing. “I realised something was wrong when I was driving and came up to a junction and realised, I just couldn’t see it. I couldn’t believe that things you take for granted can just go, be taken away, and so quickly. The charity has a range of daily living aids, from speaking watches and clocks, to audible household appliance devices, and more, including free magnifiers, available to experience at the Low Vision Centre which is open to the public every Monday, and by appointment other days.